Style isn't something you can just purchase off the shelf. It's not about swiping your card in exchange for high-end luxury threads because old mate Kanye was wearing them. In order to have true style, it's got to be something that you seek to understand. It's about learning how clothes work together, the story they tell, the feeling they evoke and the expression they allow. Style is of course never stagnant, it's forever moving and changing shape. If you subscribe to wanting to improve and develop your own style you've got to be ready to go on the ride. Be prepared to take de-tours, find new undiscovered avenues and even hit the occasional road block. It's a process of continual discovery, of being fluid, always experimenting, getting it wrong and the act of never giving up. When it comes to my personal style there is no definition. It's a bit of a pick 'n' mix, borrowing from a cross section of genres and categories and that's exactly how I like it. On one day I'd label my look fairly street, then it can quite quickly change to smart casual and then the next day I might be in the mood for luxe fashion wear to match the setting and occasion like Friday drinks in Ponsonby. My style is just me trying new things out and what it might say about me. It's not always something I get right every time, but that's the beauty, you never learn if you're always getting it right. Fashion and style are two subjects that I'm constantly pushing myself to learn more about and I do so by seeking inspiration from fashion and culture mags, blogs, fellow gramers and by simply looking out there in the real world. There's always such a volume of inspiration out there on the street, it's just about keeping your eyes open and noting how someone has pulled themselves together. Ask yourself did that guy layer something differently, wear an item in an unusual way or mash together two very distinct styles? Be open to what's out there and you'll start to see yourself gravitate to new styles and ways of fashion. Remember not everyone is going to like or warm to your style, or how you've pulled a certain look together - but that's exactly the response you need. New, unfamiliar and fresh styles can often garner a strange and off-balancing reaction, but what can't be ignored or disreputed is your originality and uniqueness. That's the true meaning of style; a reflection of your identity and who you are. Ain't nobody can bring you down when it's just you, being you. I've come up against some judgement, had people staring and whispering and it can get at you if you're not confident in who you are. You've got to own the clothes, and make what you wear say a little about you, and wear it proud. I'm forever just being me and I'll never apologise for it. Neither should you. Get out there and rock your style and if you ever need help working out what your style is, or just want some inspiration - get in touch, I'd be more than happy to assist. Follow my instagram for more men's fashion and lifestyle inspiration. 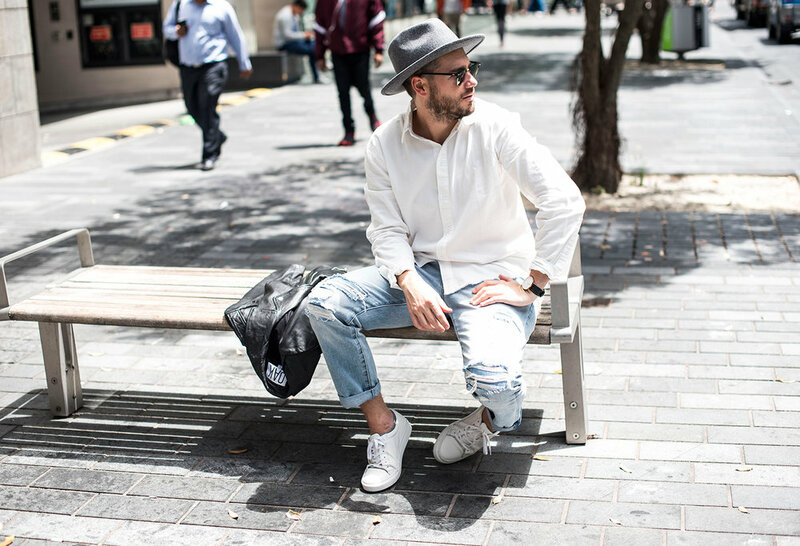 Jaheb wearing // Oak leather jacket, Neuw Denim jeans, Commoners denim shirt, French Connection leather shoes, Brixton Fedora, Ray-Ban Wayfarer sunglasses & Daniel Wellington watch.